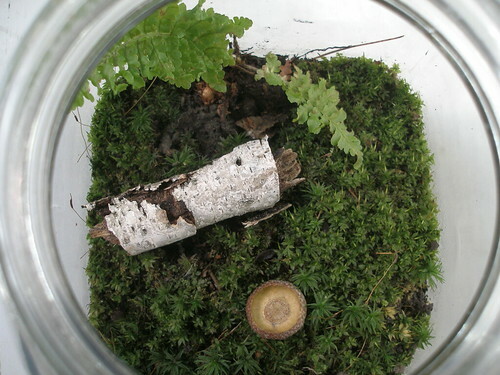 Terrarium – 1 week, originally uploaded by the workroom. Sadly, the cute mushroom turned black and died a couple days after I started the terrarium. Everything else – the moss and little fern – seem to be doing okay. I added the little birch twig yesterday, to add some visual interest. I feel like my terrarium could use a stylist. The acorn cap is still there. What a thrilling update. I guess no news is good news in terrarium world. maybe a mushroom that is growing on a piece of log/wood would have a better chance of survival in there. if i find one small enough on one of my walks in the park, i’ll bring it to you. I love it! It is so cute especially with the addition of the log, it’s like at any second a little fairy or gnome could walk by and decide to take a break on the little log. aitor has some good terrarium tips. ventilation can be an issue. i will drag him over for a consult when we are back in town. or even better, we can have a terrarium meet-up at our place. we have heard reports that his big terrarium had a bit of an upset in our absence.